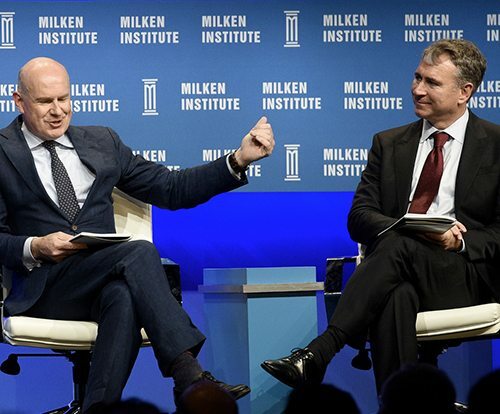 Citadel CEO Ken Griffin joined the Milken Institute Global Conference in two panels to offer his perspective on the future of the global and U.S. economy and discuss the critical importance of human capital in building a best-in-class hedge fund. In a conversation with Allianz’ Mohamed El-Erian, moderated by the Wall Street Journal’s Gerard Baker, Griffin shared his optimism for capital expenditure and demand-side growth in the U.S. (10:55), discussed the future implications of lower oil prices and America’s energy revolution (26:25), and contended that the rise of the activist investor will be a net gain for U.S. corporate governance (51:55). For the global market, Griffin forecasted Greece’s potential exit from the eurozone (36:15) and action from China’s central government to ensure continued growth for its economy (47:30). Griffin also joined other veteran hedge fund managers in a panel on human capital, sharing two of his leadership fundamentals: coach your stars and embrace turnover (26:00). And according to Griffin, the days of the lone wolf manager are over – to succeed in today’s market takes a team of high performers who are eager to learn from one another. Calling Citadel a “partnership of incredibly talented individuals,” Griffin described how learning to delegate early in his career allowed him to build Citadel into a market leader (36:00). Watch both panels at the Milken Institute.